Born prior to WWII Giselle Roeder spent her early life in the relatively tranquil setting of a rural village in Pomerania, the most eastern part of Germany ceeded to Poland in 1945. The bloody trauma of the fighting between the advancing Russians and the retreating German army in her neighborhood meant that thousands of people, including her family became displaced persons. Despite the interruptions in her education Giselle qualified as a Physical Education teacher in what was known as East Germany before she escaped to the West via Berlin. In West Germany, she was obliged to start her life all over again, recommence her training and eventually became a health educator. Following her emigration to Canada in 1963, Giselle succeeded in busines Born prior to WWII Giselle Roeder spent her early life in the relatively tranquil setting of a rural village in Pomerania, the most eastern part of Germany ceeded to Poland in 1945. The bloody trauma of the fighting between the advancing Russians and the retreating German army in her neighborhood meant that thousands of people, including her family became displaced persons. Despite the interruptions in her education Giselle qualified as a Physical Education teacher in what was known as East Germany before she escaped to the West via Berlin. In West Germany, she was obliged to start her life all over again, recommence her training and eventually became a health educator. 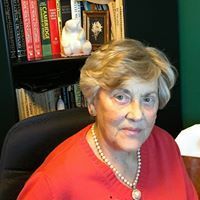 Following her emigration to Canada in 1963, Giselle succeeded in business and became well-known as an international public speaker in the developing alternative health field. She jokes about her first full English sentence, spoken to a salesman at her door two days after her arrival in Canada: "My - man - is - not home." To ask Giselle Roeder questions, please sign up. Giselle Roeder made a comment on Women's Lib - remember that? I can hardly wait to September! I wish I could say the same about my own upcoming book "Flight into the Unknown," the continuation of my memoir "We Don't Talk About That." Slow going as I had many health problems last winter. Would you let me know when your book is available? With many greetings from Vancouver Island, as always, your friend Giselle ...more "
Giselle Roeder and 1 other person liked Ann Victoria Roberts's blog post: Women's Lib - remember that? Giselle Roeder made a comment on What Do You Write?
" Dear Ann, I love this. You surely have a way with words. Many of those words could be mine, I like to adopt them, especially the way you answer the qu Dear Ann, I love this. You surely have a way with words. Many of those words could be mine, I like to adopt them, especially the way you answer the question: "What do you write?" The very last paragraph. More so the last three sentences. I look forward to your newest book, let me know as soon as it is published. Both Trevor and I wish you a Merry Christmas and a Happy, Healthy New Year. Giselle ...more "
Giselle Roeder voted for We Don't Eat Our Classmates as Best Picture Books in the Final Round of the 2018 Goodreads Choice Awards. It is not easy to describe what this book is all about. I read it because I lived through the time (WWII) with similar circumstances. Cruel it was, and cruel parts of this book are hard to 'digest' for the reader who "had no idea." I found the beginn It is not easy to describe what this book is all about. I read it because I lived through the time (WWII) with similar circumstances. Cruel it was, and cruel parts of this book are hard to 'digest' for the reader who "had no idea." I found the beginning a bit superficial in luck for a better word - but once I was into it, I couldn't put it down. I rooted for the one character, I thought of what I would do, I hated the other, I wondered what would happen next, I wished this one or the other would not come back from the war but I was not prepared for the ending. How unfair, how cruel, how can people be consumed with so much hate after many years of 'peace' - how can anyone be so brainwashed and scheming? Put innocent people into jail because of some deeply personal feelings, nothing to do with the war that was long over? I lived through and understand 'war' - but there is a time to let go, even for forgiveness. Apparently not in this 'Romance.' There is the "Real War" and then there is the private, personal war within cruel people, so full of hate that it destroys the life of the innocent, and unknowingly ruins their own life as well. We’d love your help. Let us know what’s wrong with this preview of The Cruel Romance by Marina Osipova.
" So much in this interview hit a raw nerve in me. To "walk away from it - to bring it home..." , "talks the least, listens the most" and more of those So much in this interview hit a raw nerve in me. To "walk away from it - to bring it home..." , "talks the least, listens the most" and more of those sentences gave me the shivers. I also went far away but kept everyone together. I loved "The Book Thief" and definitely will read "The Bridge of Clay." Thank you for sending me the link to this interview. ...more "
Blind Spot: Hitler's Secretary 2002 cover photo Typewriter with white fingers on it. Also available on Youtube - "Blind Spot: Hitler's Secretary 2002" ...more "
A place for fans of William F. Aicher's to ask questions or share thoughts on his books. Looking at the incredible list of books available almost makes you dizzy with a desire to read them all! Time! Time is of the essence! When to read and when to write? We Don't Talk About That is a truly remarkable book that reads like the cinematic unravelling of a Steven Spielberg movie. I am reading it aloud to my wife, Marge, and we are now up to chapter 14. We brought Kleenex for our tears. I am obviously so deeply moved by this true story that at times the writing takes my breath away and I have to stop reading. Our hearts are overflowing each day with the author's courage and initiative as a child in war. The real child depicted in the story certainly was enterprising in her search for food and friendly contacts who might help her family, and as a result, she saved lives.